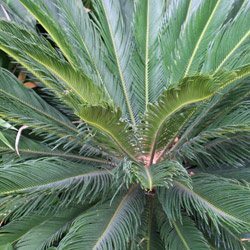 A very popular as a low growing landscaping plant in Australia this is one of the easiest of all of the cycads to grow, both in the ground and in containers. Originally from Japan (Japanese Sago Palm) where it has been cultivated for over 300 years. Cycas revoluta can be grown both in the ground and as feature plants, Sago Palms can also be effective when grown in pots or containers. Easy to grow and coping with cool climates the flower or ‘fruit’ is an interesting feature. Available for sale as young plants or large mature specimens, larger plants can be costly due to the slow growing nature. The Sago Palm (pictured right) is actually a cycad rather than a palm, and is widely udder in landscaping as well as an indoor plant. If grown indoors make sure you position it in a area where it will receive plenty of filtered light. Seen by many as a tropical to sub tropical plant it actually grows very well in temerate to cool climates as well and the home gardener should have little difficulty growing these plants. Drought tolerant once established they require little fertiliser although a slow release fertiliser in early spring, and mulch to help maintain a cool root run will help with growth. Try growing them in the ground in a sunny to part shaded position or in a deep pot or container with plenty of room for root growth. Eventually the Sago Palm may reach 3m. Like all plants cycads are susceptible to pests and diseases and cycas revoluta is no exception. Mealy bug is one and this can be treated with an insecticidal soap. Scale (Aulacaspis) is another and although not a major problem in Australia so far this can be treated with white oil if applied on a regular basis. Cycad weevil is probably the worst pest and it is present in Australia. The particular weevil is called tranes internatus and needs to be treated by a systemic insecticide or by removing and burning infected plants. Mulching to close to the trunk can cause rot as with other plants. Over fertilisation and over watering can cause leaves to yellow.